Our first impression of Gjusta was Alton the affable guard helping us find a place to park in the parking lot. Next was a pastry chef bringing out a tray of little decadent blackberry pies. WOW! 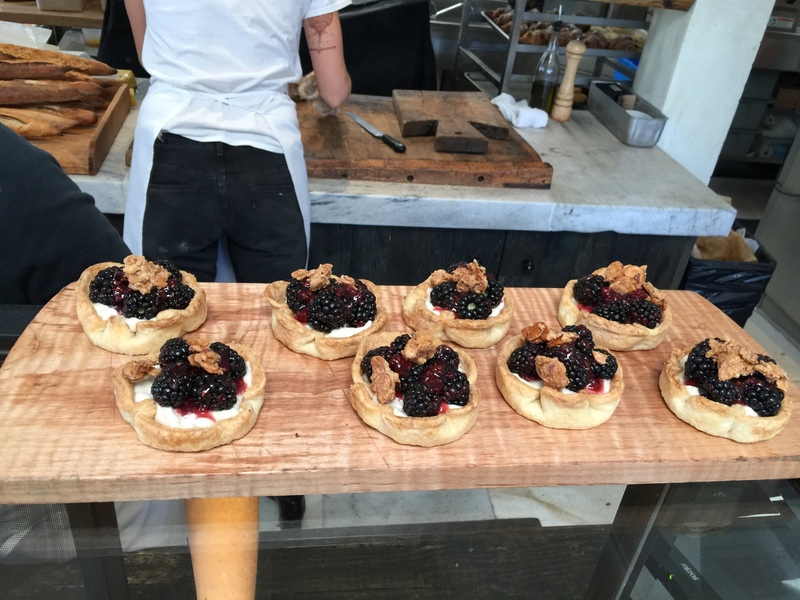 I’ve heard great things about Gjusta’s adorning sister Gjelina on Abbot Kinney. Since it is almost impossible to secure a table without reservations, we visited the next best thing – Gjusta. Well, it’s hard to secure a table here too, because they have no tables. There is a juice and coffee counter where diners stand while eating a freshly made gourmet sandwich or poking a fork into a colorful vegetable salad, yet no stools for sitting. Outside you are lucky if you can snag a low wooden bench or milk crate to sit near the parking lot. The take-away opened October 29 in Venice on Sunset Avenue, just a block from Rose Avenue. 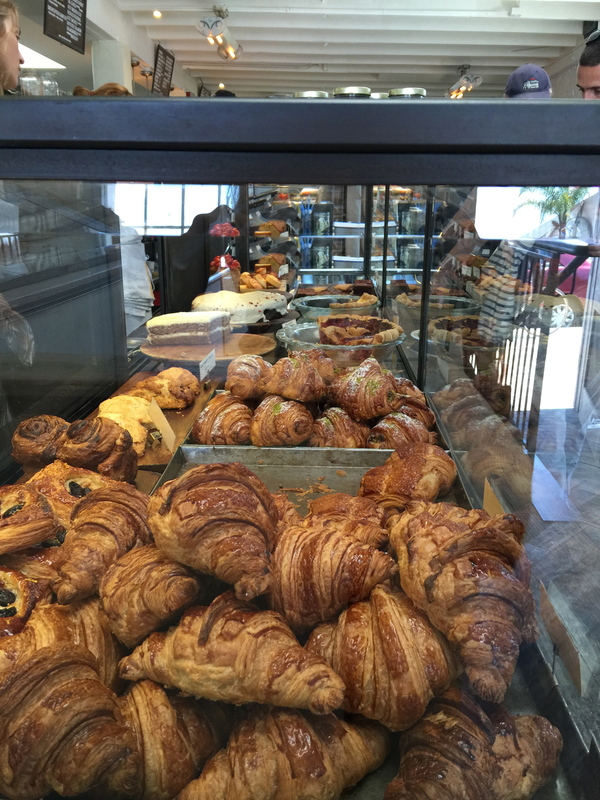 Walking in you notice a long display case filled with the most wonderful bakery items that include little blackberry tarts, slices of nectarine pie, croissants, loaves of fresh bread, smoothies in small plastic cups filled with kale and avocado or banana and hemp. Cooked meat rests in baking dishes on the counter of the open kitchen ready to be sliced for made to order meaty sandwiches. There is a glass case filled with rainbow colored fresh salads and poofy pot pies in an array of flavors. Right now they just serve breakfast and lunch, however they are longing to get approval from the city to extend their hours with a liquor license and large patio with communal seating. They actually have an extensive menu that includes beverages – coffee, tea, lemonade, steamed nut milk with coconut oil, daily fresh squeezed juice. Pastries include buttery croissants, scones, slices of carrot cake, chocolate olive oil cake, brownies, fennel and honey panna cotta and so much more with prices from $3 to $7. Breakfast is served all day with multigrain porridge waffles, quiche, frittata, grain and mushroom bowls, smoked fish and eggs, baked eggs and anchovy toast priced from $6.50 for a breakfast sandwich to $15 for a Spring vegetable breakfast with a fried egg and toast. There are smoked fish and Bialys, mini toasts, sandwiches, Rotisserie plates, Pot pies that include chicken and root vegetables, pork shoulder and green chip and mixed vegetable curry from $10 to $13. Lighter fare includes a variety of soups and deli salads. The prices are comparable with Venice and Santa Monica – $7 for a small smoothie, $12 for a vegetarian sandwich. This is a great place to pick up some delicious items to pack for a picnic and take to the beach or grab a milk crate and sit outside under a tree with others. Don’t be surprised to see a celebrity or two. The actor Tim Robbins was there the day I dined and said “hello” to anyone who looked up and noticed him. There are so many people at Gjusta, that even Tim Robbins blends in with the crowd.